Asheldham as a parish is rich in history; as a church - and its immediate surroundings - the amount of history is huge. Barry Howard spent most of 2011 and 2012 researching this. In 2013 all the findings were published. Users of The Asheldham Centre can browse these findings using the publication which is available in the Main Hall. In 2015-16 a major agricultural and settlement history and geography project of Asheldham's parish is being undertaken. The findings of this are expected to be published late in 2016/early '17. The following is an excerpt from the book 'The Asheldham History Project' published by the Team. Early man roamed the Dengie peninsula. We also know that not too far away from our area early types of beaver, porcupine, zebra, common deer and gramothere roamed. Sabre toothed tiger remains have been found to the north. Around this time the Thames flowed across our area dumping large amounts of sand - now quarried in the parish. With ice advances in the ice ages the Thames was pushed south and sometime between those ice advances man appeared - probably Neanderthals in our area - mixing with the monkeys and lions amid a rapid rise in sea level, limiting animals migrating north from the continent and likewise trapping others from escaping ever decreasing land surface area (and thus resources) southward. ABOVE: Top Left: Palaeolithic Acheulian hand axe from Clacton (BJH Collection). Top Right Neanderthals. LOWER: Map showing the extent of the Mesolithic seas between about 8,300 BC and 4,000 BC in relation to Asheldham. By 7,500 BC the climate was broadly similar to today's. The Dengie coast although 40 kms east of today's was inexorably creeping west. 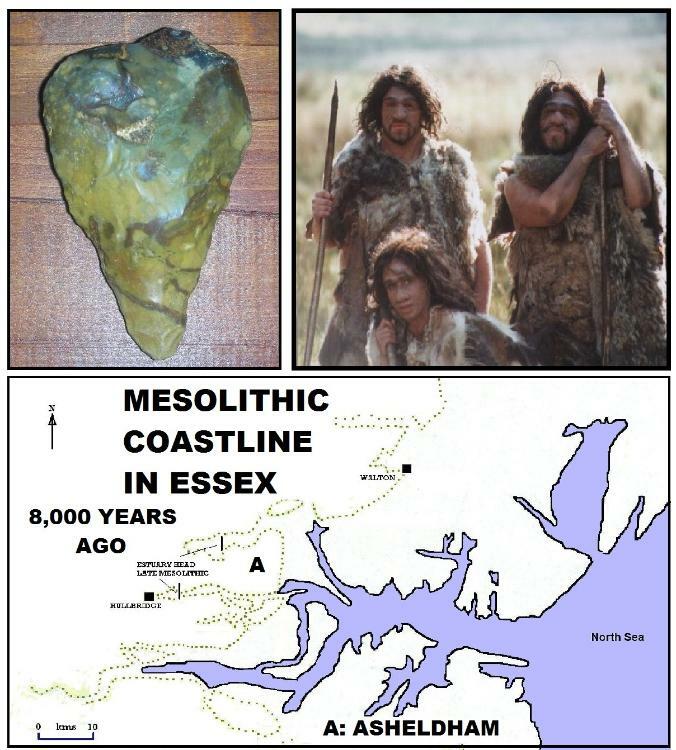 Neolithic activity is now largely submerged but on an inter-tidal area of The Blackwater estuary at 'The Stumble', settlement has been found; this is close to our parish. In the later Neolithic woodland re-grew and the Neolithic inhabitants have been found to have relied upon woodland plant foods. Bronze age peoples brought new ideas and bloodlines from the near continent; the landscape however started to change in that open landscapes replaced the woodland before around 1240 BC. Due to deteriorating climate, the west of 'Britain' was to some degree depopulated and an in-migration to the east took place - possibly (probably?) to our area where the migrants either took root or clashed with Beaker Folk still emigrating from continental Europe. Lofts Farm at Maldon is an example of a Bronze Age farmstead. 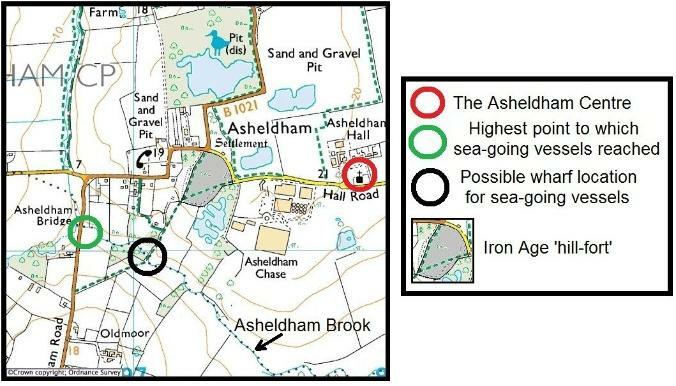 Morphing into the Iron Age, Asheldham would have been one of the areas which had a line of settlements in our case along the sand/gravel edge of the old course of the Thames. In our area there's a relatively dense cluster of Iron Age sites around the Blackwater, their settlements being unenclosed denoting probable security and feelings of safety. These were not villages in the modern sense but nevertheless collections of roundhouses with some rectangular buildings. ABOVE: The location of the Iron Age 'hill-fort' more commonly referred to as a plateau fort now in relation to river access. Life expectancy at birth was 25. If you made it to five years of age it rose to 30. That notwithstanding, the daily quality of life was good; wealth was increasing, and security likewise. Asheldham appears to have been a good place to dwell - navigable river, sea-food, good farming (a relatively recent 'creation'), a new defensive (although probably/actually a multi-functional) structure. The defensive 'hill fort' was one of few in the region - but located perfectly: in the exact centre of the peninsula equidistant from today's Crouch and Blackwater, accessible by water, with excellent food supply. I reckon it was an embryonic entrepot. The Romans arrived but have little apparent evidence in the parish, save for a remarkable road and field pattern. 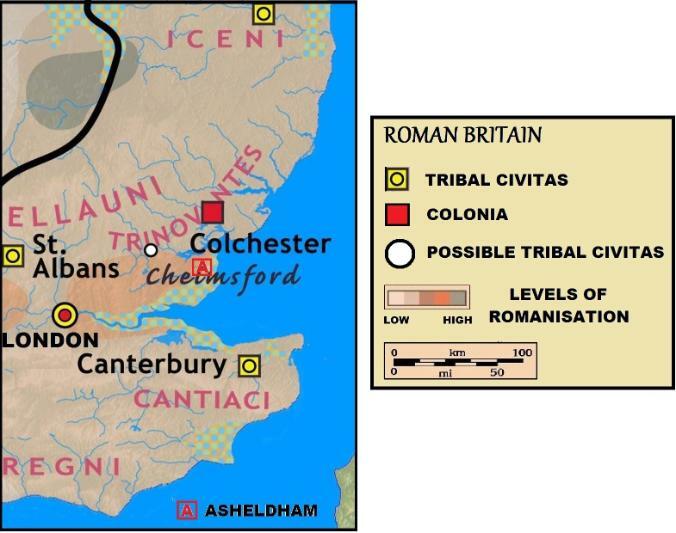 They were of course instrumental in developing Colchester first as their capital and then as a colonia, for retired officers and men; some were given land and accommodation on the Dengie and the road pattern was laid out to service them; where were the retired Roman soldiers living? We know for certain that a garrison of soldiers and sea-borne soldiers existed at Othona by the present-day St. Peter's Chapel. This was a Saxon Shore Fort with a couple of trireme galleys to sail out to intercept Saxon[?] pirates in the North Sea. Othona was perfectly situated to protect the then coast and estuaries. At Asheldham church the south facing external wall has Roman brick and tile; it's reasonable to assume that a Roman building would have been nearby. Many if not all the fields within the parish are of Roman measurement, and it will not have escaped visitors to the Asheldham Centre's attention that the approach roads are ruler straight - very typically Roman. The Romans finally departed these shores around 410 AD but it wasn't until around the late 500s that anything approaching a unified Saxon / Early Medieval kingdom appeared. Waves of emigrants landed, probably in our actual area - or even in our parish, from Jutland, Saxony, and Holland. In the first quarter of the 600s Kings Saeberht and his grandson Sigeberght ruled in south east Essex - possibly over our area. One of them came to be buried in a royal tomb in Prittlewell. This was uncovered in 2003 to reveal "...the most well preserved and excavated Anglo Saxon tomb ever discovered." (Quote from Channel 4's Time Team broadcast 13 June 2005). Saeberht was baptised and he promoted Christianity in Essex. In 616 he died. Christianity waned. Help was forthcoming from an unlikely source. King Oswiu of Northumbria received a visit from Saeberght's grandson Sigeberht. The latter wanted a re-establishment of the Christian faith in Essex. Oswiu sent Cedd south from the monastery at Lindisfarne in 653 to build a minster on the north east end of a dry gravel ridge near Bradwell - called now St. Peter's. The remains, in the form of a chapel, is one of the most enigmatic locations in the County. Christianity was restored. These were heady times for both Saxon royalty and Christianity in our area: this was a power-base for the East Saxon kings, the royal burial of one-Saeberht-being just 11 miles south of Asheldham; Cedd was made a Bishop to the East Saxons and, especially, Saeberht founded St. Paul's Cathedral. The 'provenance' can hardly get better. But what of our church-site in all this? Well it seems there was a Saxon church on our site - located on the north side of the church site roughly where the main (modern) entrance door is today; a nave of about 16 square metres and a small chancel. The date of finds : 990 AD. This would probably have been a simple stone church [see below]. It is highly possible that there was a church here much earlier - even as far back as the 7th century. ABOVE: Left...an artist's impression of what the latest stone Saxon church may have looked like at Asheldham in the 10th Century. Compare this with .....Right....the Saxon chapel/former minster at St. Peters/Othona [as it is today] some five miles to the north east of Asheldham, built in about 652 AD by Cedd from Northumbria from Roman ragstone, brick and tile. Arguably the most dramatic event in the pre-Conquest history of the area was the coming of the Norsemen or 'Vikings'. They no doubt harried the coast of the Dengie at various times as there were lots of churches which seem to have been rich pickings for the odd raiding party from modern day Denmark or southern Norway, although the north and south west of England seem to have been their main areas of concentration to start with - from about 793 AD onwards. In 865 AD the Norsemen over-wintered in East Anglia - but what a year...the most devastating for the English Saxons. Tributes were demanded lest the Norsemen decide, on a whim, to sack the area. Until Alfred decided he'd had enough of the raiding parties, mass slaughter, colossal robberies of valuable items, destruction of settlements, and using the agricultural produce as their own (well, to a point I suppose it was....). A Viking raiding party was itself attacked and executed on Weymouth beach - all were decapitated. Alfred sent his son Edward to attack a Norse camp at Beomflete (modern-day Benfleet) in 894. The outcome was an utter defeat for the Norse. "The fortress at Beamfleote had ere this been constructed by Haesten, and he was at the same time gone out to plunder and the Great Army was therein. Then they came thereto and put the army to flight and stormed the fortress and all that was within and brought the whole to London and Rochester, and they brought the wife of Haesten and his two sons to the king....."
With rich farmland – albeit probably still sheep and not as much arable as in Roman times, the Dengie probably looked like good picking for a fast moving Norse raiding party intent on eventually settling down – but not yet. As was their want, churches were targets for thieving and robbery; no doubt the Saxon church at Asheldham would have been emptied of its gold cross, chalice and priests accoutrements. Perhaps and maybe. The Anglo Saxon Chronicle states: Her wæs Gypeswic gehergod, æfter þæm swyðe raþe wæs Byrihtnoð ealdorman ofslagan æt Meldune. on þam geare man gerædde þæt man geald ærest gafol Deniscum mannum for þam myclan brogan þe hi worhton be þam særiman, þæt wæs ærest .x. þusend punda. Þæne ræd gerædde ærest Syric arcebisceop. “Here Ipswich was raided. Very soon after that, ealdorman Byrhtnoth was killed at Maldon. And on that year it was decided to pay tax to Danes for the great terror which they made by the sea coast; that first [payment] was 10,000 pounds. Archbishop Sigerīc decided first on the matter."